Family Friendly, Gorgeous Views of Mtn, Private, and Great Location! GREAT LOCATION! Beautiful, Private, New Home 1/4 Mile to Mountain, Wonderful Hiking, Activities & Golf Resort. Gorgeous, mountain side, family-friendly post & beam home. Ready for your rental and enjoyment! 1/4 mile from Sugarbush base and Sugarbush Resort Golf Club (Robert Trent Jones, Sr. Masterpiece golf course). The house is located in a small subdivision with 9 lots and only 3 houses built on Colony Rd. and 1/4 mile to the lifts. It is quiet, private and a couple nearby neighbors - all just off the Sugarbush Access Road. Also, located on the MAD BUS route for ride to and from the mountain. Spacious & cozy accommodations with open concept, gourmet & fully stocked kitchen with Wolf duel gas range, great room with gas stove with remote and 55" smart LED TV with Sonos sound bar, water filtration system, dining room table that seats 8, plus comfortable bar chairs for 5 at kitchen island, large deck with gorgeous views of the mountains, tons of board games for a day off from skiing, large mudroom with benches, radiant heating on first two levels, back up generator for full house power in case of a storm, nice linens & towels for ultimate comfort, and more. Large game room with large couches and over-sized bean bag, ping pong, multiple LED TV's with HD on multiple floors, 3 bedrooms upstairs (1 king bedroom, 1 queen bedroom, and bunk room with 5 twins and 1 full-sized bed) with loft comfortably sleeps 11. There is a large ski, board & bike locker that accommodates all your equipment on same level as exit door and parking. The house is open, spacious, well thought out, and clean. Guests are welcome to reach out to the owner at any time with any comments, questions and/or recommendations. Happy to provide info on our personal favorite dining locations too. It is easy to get around and convenient as the house is located on the MAD BUS route for transportation to and from the mountain after a day of skiing. Also, located close to the Paradise Deli on the Access Road to pick up from last minute groceries or grab a breakfast sandwich. Down the street from the Sugarbush Health & Racquet Club (SHARC) which has Indoor & Outdoor Pools, Hot tub, Squash, Racquetball, Indoor Tennis Courts, Gym, and Massage. PLEASE NOTE WE DO NOT ACCEPT LONG TERM OR SEASONAL RENTALS. Holiday rates higher. We have grown up coming to Sugarbush and love the mountain, the area and the community which is unique to Mad River Valley. In the east, this is the place to be, in any season. We find something special about each season and love learning more about the area and the community. We stumbled across one remaining lot available a number of years ago. We were fortunate enough to purchase the lot with a dream of building a home - more like if there is a will, there is a way mentality. It worked! We were able to build this post & beam home and finished the end of 2013. We rent the house, so others can enjoy as we do. toilet, shower, Large capacity washer/dryer in this bath too. Paper products, shampoo/soap, trash bags, cleaning supplies, sponges, and linens/sheets/towels are provided. 1/4 miles from Sugarbush Resort and approx. 6 miles to Mad River Glen. Quiet 9-lot subdivision off the Access Rd. Beautiful Views of Sugarbush Mountain from the house and deck. Hard wired phone available for local calls and emergencies. Provided in the warmer months (in every room). Radiant heat on basement level and first floor. Baseboard available on 3rd level. High quality sheets and towels are provided for ultimate comfort, including toilet paper and paper towels. Large HE capacity washer & dryer in the bathroom. Detergent & fabric softener sheets provided as well. Large capacity HE washer & dryer in the bathroom. Detergent provided as well. Jotul gas insert with remote. Outside parking for 4+ cars. WiFi available on all three floors. Password available with entry instructions. Down the street from the Sugarbush Health & Racquet Club (SHARC) which has indoor pool/hot tub, Squash, Racquetball, Indoor Tennis Courts, Gym, and Massage. Beautiful oriental rugs throughout the house. Large stainless refrigerator with french doors with over 26 cu. ft. and filtered water. Wolf Duel Fuel Range with oven. Two large grates for pancakes or burgers/steak. Microwave and convection oven in one. Keurig machine and a 12-cup coffee maker with filters provided. Some k-cup available. Includes spices and condiments in the refrigerator, including salt, pepper, sugar, flour, and more! Many dishes and utensils. Fully stocked kitchen with most all cooking utensils you could need. Cuisinart chef's classic non-stick hard anodized 17-pc set. Over-sized 6 qt, crock-pot with liners. Gourmet kitchen with Wolf duel fuel range, Miele dishwasher, soapstone countertops, custom cherry cabinets, water filtration system, and more. Stocked with all the cooking items you may need. Dining room table seats 8 + Kitchen Island available, which seats another 5. 3 flat screen LED tv's with HD cable, on different levels. All 3 TV's have HD cable and there is DVR capability in the living room. Sonos sound system sound bar available on the main level and Bose speaker with iPhone hook up. There are two DVD players, one in the living room and the other in the game room downstairs. The lower level has a game room for kids with two large couches, large bean bag, ping pong table, a 60" LED HD TV with Blu-Ray player and smart capability to access Netflix, Amazon, and much more! Board games include: Chess, Boggle, Clue, Bounce-Off, Jenga, Hoot Owl Hoot, Apples to Apples, Taboo, puzzles, Cards against humanity (1 & 2), Monopoly, Scrabble, Pictionary, cribbage, cards and more! Netflix and Amazon accessible. You are welcome to use our Amazon link to movies already purchased. Gorgeous large deck with two tables and several chairs with a view of the mountain. Dine alfresco mountainside or simply enjoy the views. Ski and Snowboard locker available outside for all equipment. Tennis nearby (Bridges & SHARC) with pools and more. Robert Trent Jones, Sr. Masterpiece Golf Course located 1/4 mile down the street. Golf locker, Hogan's pub and more. Jones' legendary course has 18 holes, par-70 (men) and par 72 (women). Down the street from the Sugarbush Health & Racquet Club (SHARC) which has indoor and outdoor pools, hot tub, Squash, Racquetball, Indoor Tennis Courts, Gym, and Massage. For a fee - down the street from the Sugarbush Health & Racquet Club (SHARC) which has indoor and outdoor pools, hot tub, Squash, Racquetball, Indoor Tennis Courts, Gym, and Massage. You will feel at home here! Excellent location with views and walking distance to the mountain. During the winter months, there is tranportation via the MAD BUS from our street. Great mountain biking in the immediate area, along with lots of swimming holes and pool facilities, tennis, hiking and summer day camps abound. The Mad River Valley hiking and biking trail systems are available in warmer months. For more information and to support the trails, check out the Mad River Riders, Catamount Trail, Long Trail, and Mad River Path. Please feel free to ask additional questions! I am available to assist. We have stayed in this home the last two years. Good size group of college friends on our 37th year of skiing at Sugarbush. This home is awesome. Very well appointed, great kitchen, heated floors, lots of room for different activities and very close to the mountain. Not sure there is a better spot! We went the second weekend in March. After worrying about the weather being two warm, we had light snow, fresh powder and perfect temperatures. The house is excellent - has everything you need and very close to the mountain. Would return again without hesitation! My friends and I have been going to Sugarbush for over 30 years. We love the area! We have always had trouble finding a high quality place to stay. Until now! 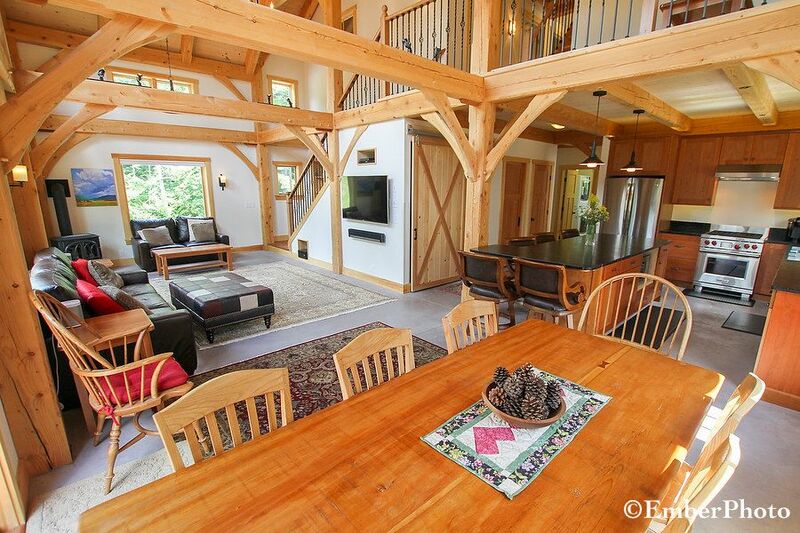 This property has everything you need to have a great ski weekend! Lots of room, well furnished, high end kitchen with lots of quality amenities. From the heated floors to the high end kitchen gadgets! This home made this years event one of the best ever! This house was better than advertised. It definitely has the wow factor when you first pull into the driveway. a group of friends and I came to town for a wedding and we could not have been happier with this house. It could comfortably can fit 6-10 people and it still feels very large inside. The basement is perfectly secluded from the main floors of the house. The living room/kitchen are fantastic to hang out and relax with an incredible back deck to hang out on. Beds/bathrooms were very clean and comfortable and there were plenty of clean towels and linens for the weekend for us to use. I can't think of anything this house was missing, other than some fresh pow for us to go skiing (but we were a bit early in November). We would all love to stay here again during the ski season. The host was great, give us detailed information before our stay. Thank you Holly! Five Stars!! We are thrilled that you loved our home and location. It is quite a gem! Thanks to you and your group for taking great care of our house. We hope you will return again and again! The snow has started to fall and we are looking forward to an excellent winter season as well. This home was very clean, comfortable and above all, set in beautiful surroundings. There was plenty of room to spread out and relax indoors or out. Thank you for the review. We are glad you and yours enjoyed your stay. We hope you will come visit again. Great house with owners who were great to work with! Weekend getaway for two families. Loved this house. We did not go during ski season but it is a great location for Sugarbush and also close to Mad River Glen. House in immaculate condition and very well appointed kitchen. Would have been great if hot tub use included but, alas, it isn't. Would stay here again in a heartbeat! Thank you, Doug & Pat! You were all terrific guests and took great care of our home. Hope we see you again! Located right off the Sugarbush Access Road and is 1/4 mile to the lifts and the base of the mountain. The house is located on a quiet subdivision with only 3 houses. Also, only a few miles away to Mad River Glen and less than a mile to Sugarbush Golf Resort as well. The Mad River Valley is one of the best outdoor communities to live in. Besides having two of the best ski resorts (Sugarbush and Mad River Glen), the area is loaded with great restaurants, bars, shops, art, activities and character. Sugarbush Resort is a wonderful mountain for all levels of skiers. The ski school is terrific as well. It is very convenient to get to the mountain (via The MAD BUS shuttle), walk or by your car. There are several great restaurants in the Valley. We'd love to share some of our favorites with you or another other information that we may provide. The Mad River Valley hiking and biking trail systems are available in warmer months. For more information and to support the trails, check out the Mad River Riders, Catamount Trail and Mad River Path. - HOLIDAY RATES HIGHER. All rates subject to change until deposit and booking received and confirmed. - Security deposit (refundable) $500.